Perfect Cherry Blossom features three different playable characters to choose from, with two different Spell Card types each. Reimu Hakurei can weave through the smallest gaps with ease, and her attacks deal low to decent damage, depending on which type you use. Marisa Kirisame relies on her speed and power to compensate for her thin attack area, but the amount of power she wields is very considerable. Sakuya Izayoi has even wider and more versatile attacks than Reimu, but can be quite tricky to use and maneuver. 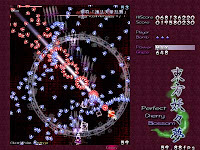 Almost every part of the game is linked with the 'Cherry Meter'. Shooting enemies increases your Cherry points, bombing or dying decreases your Cherry points, and reaching 50,000 Cherry points gives you a temporary shield. The higher the Cherry Gauge becomes, the more points you gain from Point Items. Press the shift key to slow down the player's movement, makes the collision box visible and changing the properties of your attacks. When fighting a boss, a position marker shows up on the bottom margin of the screen, indicating where the boss is on the horizontal axis. Since your target can be completely obscured by bullets or darkness at times, use this marker to help you aim your shots. The marker will dim when the boss is being hit, and will flash red when her health bar gets sufficiently depleted.